The Western bagua map (also called the BTB feng shui school bagua) is really easy to define and apply in your home or office. All you need is the floor plan of your space, as well as additional paper and pencils. Using tracing paper often makes it easier to define your Western home or office bagua. But first, do you know what the Western/BTB bagua is and how it differs from the Classical bagua? 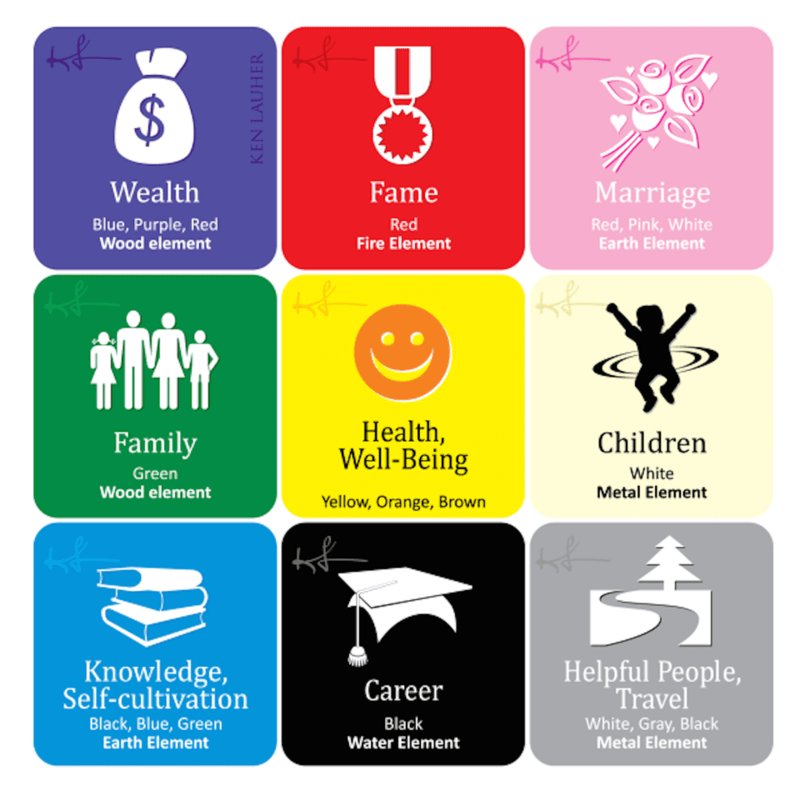 The Western feng shui school bagua consists of the same 9 areas as the classical feng shui school bagua. However, the compass directions are not taken into consideration in this feng shui school. The way you lay the Western bagua is by aligning the lower end of the basic bagua grid with the wall of the front door of your home or office. Step 1. Create a grid with nine squares (or rectangles) that will fit over your home or office floor plan. Using tracing paper of the same size as your floor plan can make it much easier. Step 2. Once you have your grid ready, superimpose it over your floor plan by aligning the bottom row of your grid with the wall of your front door. Once you know the areas of your home or office that belong to specific areas of your life, you can start applying proper feng shui cures and improve the quality of energy in your home. Note that you can always use any cure from the classical, or traditional feng shui schools (maybe with just the exception of the annual feng shui cures, as this can be very confusing to apply with the BTB school). The way to find the best feng shui cures for any area of your Western home bagua is to look for cures recommended by the classical school for the same bagua area (just ignore the directions since they are not taken into consideration in the Western bagua). Now, do you really need to apply the bagua map in order to create good feng shui in your home? And can you actually combine both baguas - the Classical bagua and the Western bagua - in different rooms in your house? These are all good questions that I get asked a lot. I always suggest people work with only one bagua style, at least for a period of time, in order to see results from their efforts. Choose the bagua that works best for you and your space and allow all its possibilities to show themselves to you. Feng Shui: What Does Your House Facing Direction Mean? Which Feng Shui Bagua is Right for Your Space?